Spatterdock is a floating, heart-shaped leaved plant with large, yellow flowers. Spatterdock (Cow Lily) is a floating-leaved perennial. It has heart-shaped leaves with wavy edges attached to long, stout, rounded stems. These large leaves are green or yellowish in color. The stems on Spatterdock (Cow Lily) can often reach to be 6 ft. long. 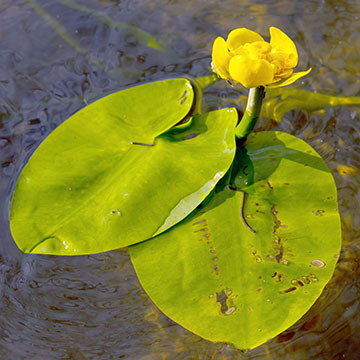 Spatterdock (Cow Lily) also has large, half-opened, globular yellow flowers at or above the water's surface. The flowers bloom during summer into fall. Spatterdock (Cow Lily) can most commonly be found in Eastern United States. Treat Spatterdock (Cow Lily) with Dibrox® or Spritflo® herbicides. Spatterdock thrives in nutrient rich water. To better help prevent Spatterdock (Cow Lily), treat your water with our Nutrient Reducers (MuckMaid®, SparKlear®, PhosControl®). You can order these products on this website.